The above is a photo of my knitting time the night before last. All comfy on the lounge, stripey socks, glass of wine, knitting and watching “I Survive a Japanese Game Show” and then “Airline USA”. I do love me some airline shows. I find airports fascinating. I haven’t traveled much, so far only to Hamilton Island. That is as far as I have been on a plane. I hope one day to get to go travelling overseas. Especially to Japan. Although the airline may not let me back on with my luggage as I would buy A LOT of super cute Japanese things. Kawaii all the way! 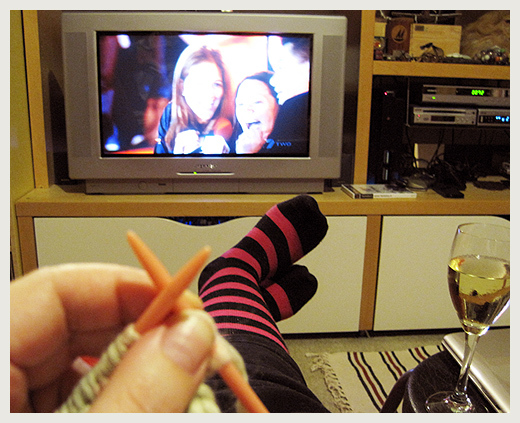 Hi Alysha, How cosy do you look there in front of the tv with your stripy socks, wine and knitting. Oh what a night of pure bliss. I love this photo. Thanks for sharing your video, wow, I have no idea re videos to computer. lol. Something I really should learn to do. Thanks so much for sharing. I wasn’t sure how to embed the video so I used the easy Flickr option! I made it with my little canon ixus, pretty good video for a small camera.